First of all, thanks for the awesome plugin. We recently installed it on our client’s website and they’re really happy with the result. However they noticed that although the custom meta fields can be filtered but they’re not actually searchable. Any chance you could let us know how to add this functionality in if possible? Thanks for the compliment. Can you tell me a bit more about the school field? Is it custom field containing and id the School post type or is it just text? 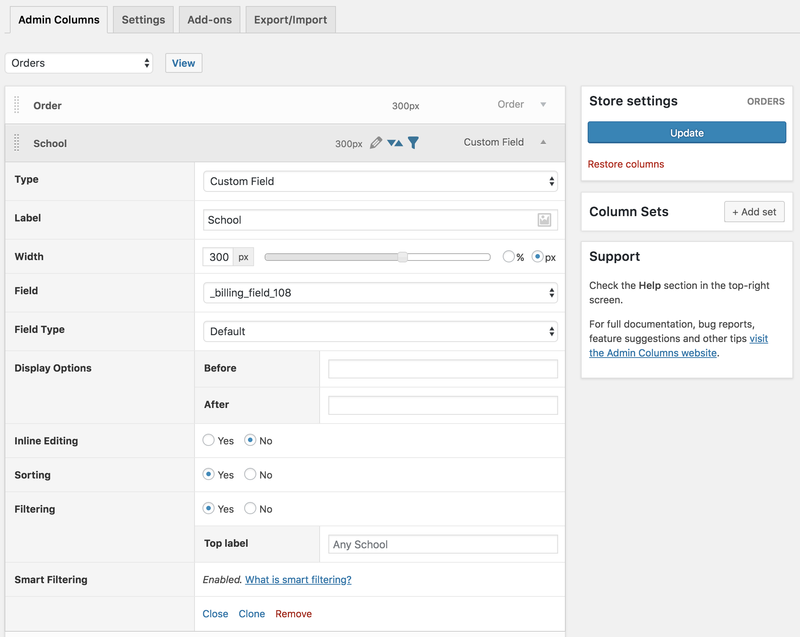 And can you show me how you set this up with maybe a screenshot of your Admin Columns Pro settings? Please see my answers to your questions below. Can you tell me a bit more about the school field? 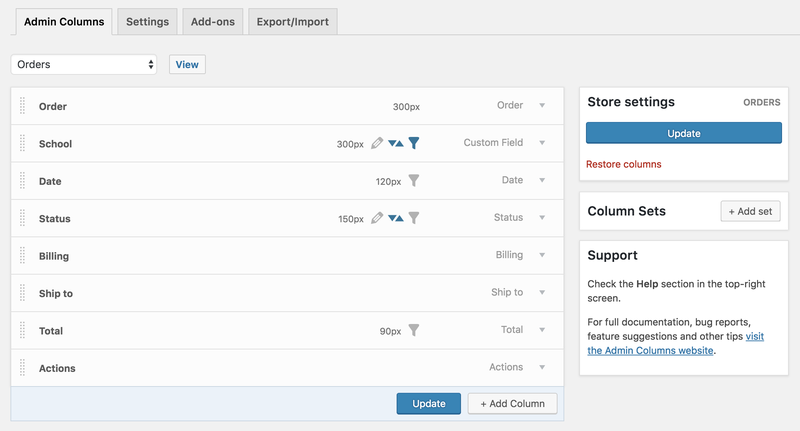 This is a custom meta field that we added to the order post type. This is done via a 3rd-party plugin and I believe what it’s doing is simply adding some metadata to the order post type. 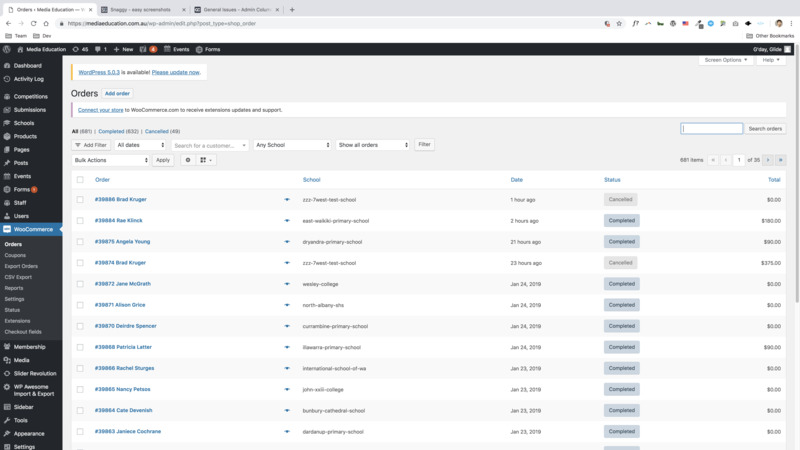 Right now all the order can be filtered by the school name, so what our customers want is the ability to search order by school name. Is it custom field containing and id the School post type or is it just text? It’s a custom meta field as mentioned above. And can you show me how you set this up with maybe a screenshot of your Admin Columns Pro settings? The images don’t seem to be loaded so could you please use the following links to view them: https://ibb.co/n0mpZ1w & https://ibb.co/PztzYQv ? Please notice that our plugin does nothing with the default Search field in WordPress. Instead, we have our own way of dealing with filtering the overview page. For you case, I advise you to use smart filtering and use this to search order for a specific school. To do that, click on the ‘add filter’ button on top of the overview page, select school and choose how you want to search (contains, is, etc).